The EPL-QP-1X150RT-200-MOD1 Quadpod Mounted Explosion Proof LED Light Tower from Larson Electronics produces 17,500 lumens of light capable of illuminating an area 9,500 square feet in size. This adjustable Cree LED light tower is designed for portability and durable operation and ideal for use in demanding conditions. The EPL-QP-1X150RT-200-MOD1 is a quadpod mounted explosion proof LED lighting system and provides 9,500 square feet of work area coverage with 17,500 lumens of light output. This portable LED light tower has a removable LED light head mounted on top of a four leg durable non-sparking aluminum quadpod equipped with wheels for easy positioning of the unit from one area of the workspace to another. The LED light head on this unit produces a wide flood pattern of light that is ideal for illuminating large workspaces and job sites. This light is designed for heavy duty use in demanding conditions including emergency services, mining, construction, marine, and industrial operations where durability and reliability is critical. This hazardous location LED light tower is equipped with 200` of Southwire Seoprene® Type TPE SEOOW cord in a 16 AWG, 3 conductor configuration with a black jacket terminated in an explosion proof cable gland, which is combined with adjustability offered by the LED light head provides ample length for tower placement and optimal coverage of the workspace. Cord cap options include 15 amp NEMA 5-15 straight blade plug for designed for 125V, 20 amp NEMA 5-20 plug design for 125V, and 20 amp 6-20 plug designed for 250V. All three cord caps are designed to lock into compatible twist lock receptacles by twisting the plug body until an audible click is heard, which indicates the plug is securely connected. Once locked into place this plug will not accidentally pull out. Other cord caps, such as pin and sleeve style, can be custom fit upon request. 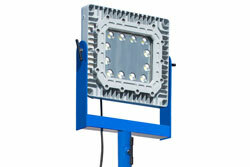 The LED light head on this tower contains twelve 12.5 watt LEDs producing 116.67 lumens each. These LEDs are arranged in rows and paired with high purity optics to produce 17,500 lumens and a flood beam while only drawing 1.25 amps on 120V, making these units ideal for use as highly efficient yet powerful work and area lights. The EPL-QP-1X150RT-200-MOD1 hazardous location LED light is an ideal and direct replacement for fragile and hot running 400 watt metal halide floodlights.